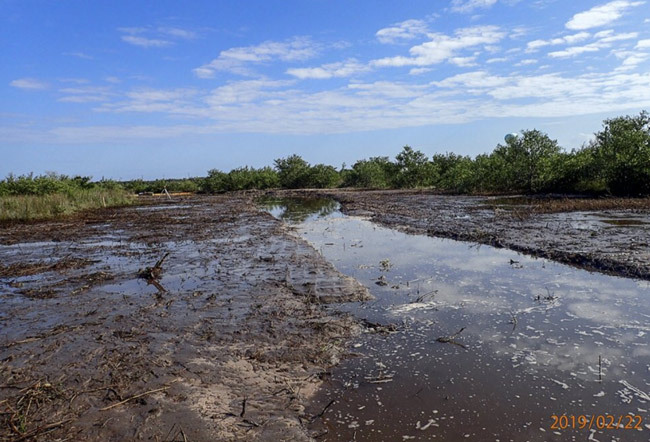 FLORIDA - Construction on the controversial $516,000 Flagler County Coastal Wetlands Restoration Project began on Feb. 13 on 100 acres of decades-old dragline ditches in the area of the Intracoastal Waterway, parallel to Gamble Rogers State Recreation Area and parts of Flagler Beach. Like the “turbidity” it produces when an excavator demolishes and rebuilds the ditches as wetlands to how they might have looked like before the 1960s, the construction is kicking up a new round of controversy and dissatisfaction from homeowners near the project, who say buffers are being violated and acreage is being demolished beyond the original scope of the project. St. Johns River Water Management Officials, whose agency is sponsoring the project, say disruption to ecosystems and turbidity have been kept to a minimum, and the project is progressing at the rate of 2 acres a week without a hitch. They’re posting drone video that shows the project under sparkling light. Residents are posting their own videos that in their view tell a different story, as do their own in-person observations. Watt showed drone-video footage shot on march 29 that showed the completed A section of the project: sparkling water, lush-green vegetation rimmed by white sands and narrow water channels in some places, not so narrow in others. He showed a picture the water management district has been showing for a while: a fisherman holding up a colossal redfish “caught near worksite.” To press the point, an excavator is in the background, across a strip of water. So is the Flagler Beach water tower.